As a UK registered charity, Best Beginnings wanted to provide parents and parents-to-be with support, helpful information and tools during their pregnancy and for the first six months of their baby’s life. 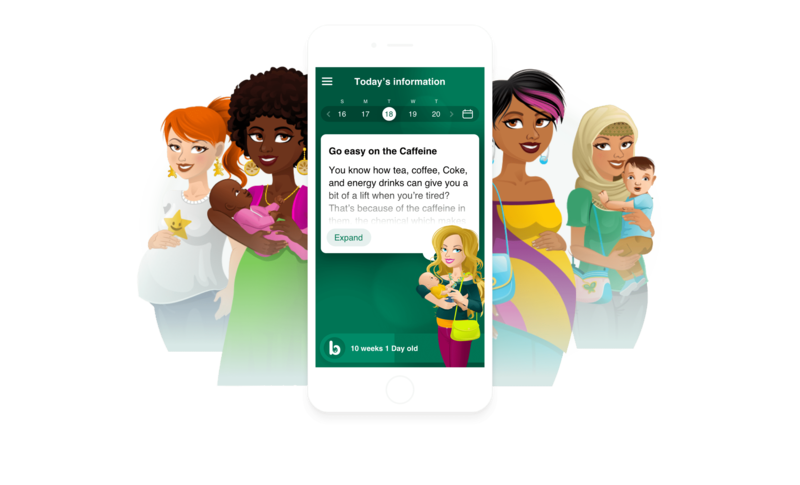 Baby Buddy is an app for iOS & Android, with a purpose to become a trustworthy virtual ‘friend’ that could share vital health information with the user, whilst remaining upbeat and supportive. Inform and empower mothers-to-be and new mothers with a helpful, intuitive mobile app that they can trust, like a friend. Our approach was to conduct extensive qualitative research and co-production with healthcare professionals and new parents, to understand health inequalities in the UK. For example, one discovery was that a baby born in Wolverhampton is six times more likely to die before the age of one than a baby born in Bath, which is just unacceptable. We created Baby Buddy - an app innovated to provide parents and parents-to-be with a trustworthy virtual ‘friend’. To make the experience fun and personable, a considerable amount of experimenting, behavioural testing and fine-tuning of the UX was required. Due to the sensitive and personal information being stored, data needed to be secure and anonymised for analysis, and personalisation. We therefore integrated a powerful, secure analytics system to provide usage analysis that helped inform and improve the health of our users. The app has many features including a step-by step journey, tracker and goals management, a Q&A service, appointment setting, videos and explanation guides - all done in a fun a personalised way by allowing mothers to customise their own baby expert avatar. More than 95,000 unique users have downloaded Baby Buddy and it has received endorsements from some of the largest healthcare organisations across the UK. Not to mention Alison Baum the founder and CEO has been awarded an OBE. Baby Buddy has also received health specific awards at the inaugural AXA PPP “Health Tech & You” and RCM Awards. “Best online resource for mums and mums to be”. Most recently Baby Buddy won the digital industry's prestigious BIMA award for the Well-Being & Health category and 'Digital & Technology' category at The Guardian's Public Awards. Surveys conducted found that Baby Buddy helped more than 80% of users learn more about pregnancy and almost a 100% of parents felt it helped them to look after their own health with a quarter reporting a significant health impact.